In the pergola above, we can see how to attach a pergola ledger board over a window frame to support the rafters. It looks so inviting, doesn't it? This is an ideal way of creating an outdoor room attached to the house, but is not so easy for those who have little or no space to fix a ledger board below the overhanging soffits, fascias or roof line. 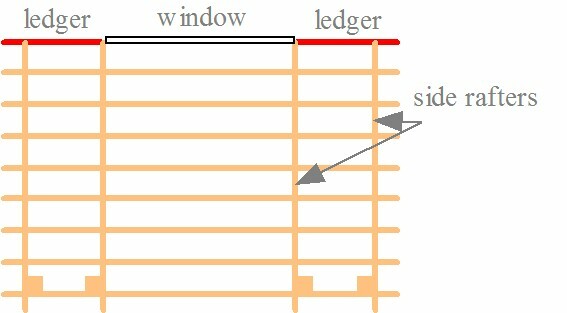 How on earth can we fix the ledger when the line is broken by the window? Craig, Sue, Bob, Dev and Phil have all been trying to find the solution to this same problem in only the last few weeks! There is a way around it, fortunately, and one which keeps the open space in the centre. Bonus! We need to think outside the box and get the creative juices flowing. Firstly, there is the easy way and the complicated way. Let's take a look at the more complicated way first. This would involve removing the tiles, fascia and soffits, attaching a metal angled bracket (as opposed to an 'angle bracket') to the SIDE of the house rafters (never the ends, as the structure wouldn't be strong enough to take the weight), and protruding through the fascia, to hold the ledger board...and then reinstalling all of the materials. If you feel that you can manage this, you can attach a pergola ledger board to your house above the height of the window, either sitting in front of the fascia or just above the tiles. Like most people, you are probably looking for an easier solution! This one is just that, and the adjustments are really quite straightforward. I usually suggest having the rafters running in the opposite direction to normal, with the side rafters acting as the main support rafters and spanning from the ledger to the posts, with the decorative rafters running parallel to the house. Let's see what the difference is, and what each looks like. 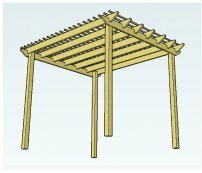 The pergola, shown below, made from the lean-to pergola plans, has the rafters running from the ledger board, attached to the house, to the main rafter, supported by the posts. Notice how there is ample room for the ledger board between the window and soffits/fascia. This is the way that the pergola would normally be built. 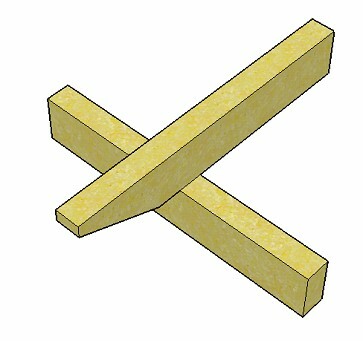 Now let's take a look at a pergola kit that has the rafters running in the same direction as the wall (parallel to it). We can see clearly how they attach a pergola ledger to their wall. Of course, there is no window to consider...and the pergola kit isn't very long. Most of us building a pergola over a window have a longer stretch than the one shown. 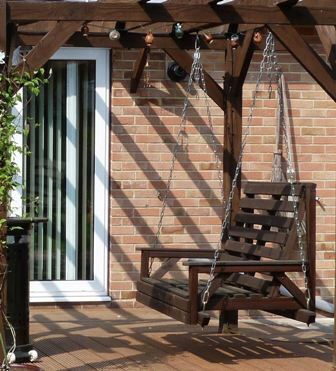 Your pergola will probably look very different to the one below but the principle is the same. This is where we need to get creative! We're going to have two shorter ledger boards each side of the window. These are going to support the side rafters, which, in this case, are the main support rafters. The raised rafters, running from front to back, are going to sit on these. Often, the length of the beam span, from one outside post to the other, is too long. 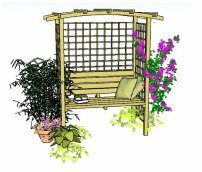 Many people, who want to build their own attached pergola, contact me to ask if they can have a span of anything between 15ft - 25ft without extra support posts. It's the desire to have the uninterrupted view which is so enticing, and I fully understand. However, it is more than likely that, over time, the main supporting rafter will sag, especially if there is the added weight of a vigorous climber. It's definitely better to err on the side of caution. If we take a look at the 2D diagram, we can see the two extra inside side rafters running from the ledgerboard to the inside posts. 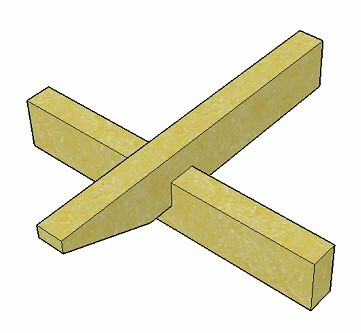 These give strength to the structure, making it much more stable and able to take greater weight. An added bonus is that the 8ft space in the centre gives an uninterrupted view through the window. I have taken Bob's pergola as an example because he has relatively easy dimensions to work with. Bob had an existing pergola that had collapsed under the weight of the climbers, the original bracket above the window being too weak to hold the structure. He needed to replace the pergola, in order to have a shaded area protected from the sun. 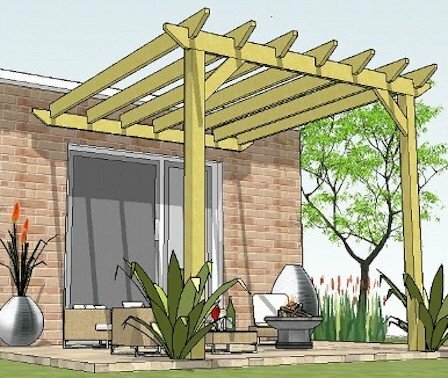 I wish to build a lean to pergola but have a fundamental problem which is I am in a bungalow and in the middle of where the main support attached to the house would go I have a large 8' patio door which goes right up to the soffits. I would be looking at a length of 5 metres by a width of 3.2 metres, the door falling in the 5 metre run. I have wall available either side of the door. Any ideas? So, 8ft is 2.4m , with a 1.25m ledger each side, that makes up, approximately, the 5m span (with a little jiggery pockery!). 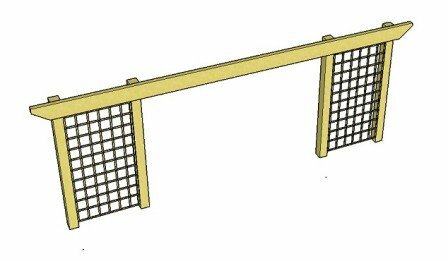 Why not attach trellis? It can give a really enclosed and cosy feel to this type of outdoor room, provide a little more shade and is a great excuse for growing some fabulous climbing plants! I prefer a raised rafter on this type of pergola. The rafters can be fixed on top for fully un-notched rafters, too. Here we can see the different look each style gives. The advantages of building your pergola this way is that everything is supported really well...and you get a room with a view, too. Best of both worlds, really! 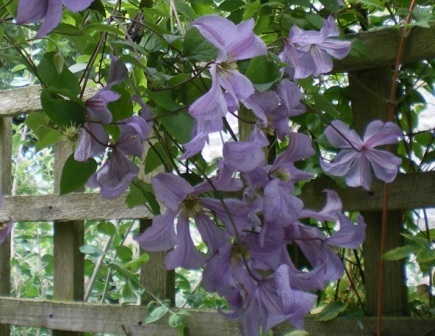 Don't forget those gorgeous climbing plants. They make all the difference. 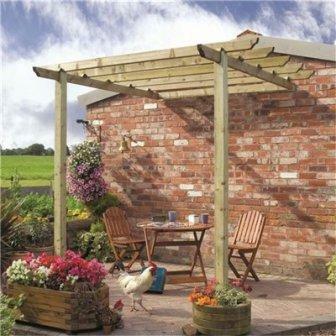 Good luck to all who have emailed about this style of pergola. Make sure to send a photo when you've finished...and, indeed, anyone who has built their own pergola, or made one from a kit. I love to see what you have achieved. The easiest way send your photo is by uploading it in the form below. Just send it on its own (you can send up to four)...or if you feel like writing a bit, that would be great. Just give your photo a name and away you go. It's great to tell others of our achievements; the pride we feel, and how it has made a difference to our lives. 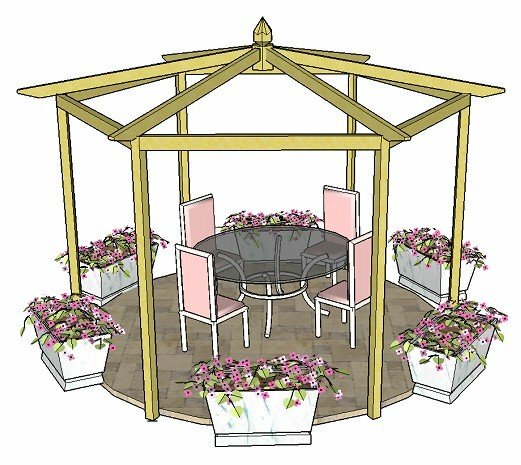 Be an inspiration to others who are thinking of building their own pergola. Help them to have the confidence to take the bull by the horns and give it a try. It's often all that is needed to inspire someone. After all, you have been there and done it. Tell your story. We would all love to hear it! Do you have some pictures of your finished pergola? Or perhaps you took some as you were building it. Great! I hope this has helped you to think about how to attach a pergola ledger in the easiest possible way. Enjoy your outdoor room this summer. It's a very special time!